Backsteet Greene King pub that shares its premises with a Thai restaurant. Ales were not just from the Greene King range - Greene King IPA & Abbot, Morland Original, Westerham British Bulldog, Joules Slumbering Monk & Harviestoun Bitter and Twisted. The pub has a small bar area, which has a cosy feel and a larger area beyond for diners. Most of the customers were here for the football, including a fair few people I knew. Live football was showing. The Southern Cross is a short walk away. So this is probably the best area for drinking in Watford and not too far from Watford Junction station. Nice back street boozer. Good range of well kept Greene King ales and guests. Thai food was the best I've had in a pub for ages. Nice friendly service. 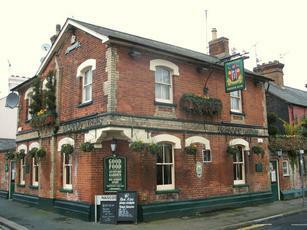 My fav pub in Watford. Greene King but not tied so has about 6 ales on with 3 at least always changing. Great old fashioned seating. Sports screens galore. Tiny bar and always busy. Does Thai which seems popular but never tried myself. Although a 'local' its one you feel welcome in. My suggestion - pub grub at Southern Cross, then session here. When we visited on Sunday there was a power cut, but fair play to them, they were still serving. Six ales on tap - we tried the Rocking Rudolph (H&H) and Iceberg (Titanic) which were both on good form and �3.20 for a pint. No food, due to the power cut - and anyway, we'd arrived too late in the evening. Will go back for a fix of Thai. Friendly staff, very welcoming atmosphere and nice decor, with plenty of football memorabilia around the walls. It is a bit hidden away, but makes seeking it out all the more worthwhile.